Rabbi Joseph B. Soloveitchik, ztâ€�l, known as â€œThe Rav,â€� exemplified the value of studying in anticipation of Jewish holidays (chagim) through his lectures and study sessions. Every year, several weeks before Pesach, the Rav learned the laws of Pesach and the Haggadah text with his students at Yeshiva University and with the general public at Congregation Moriah in Manhattan. 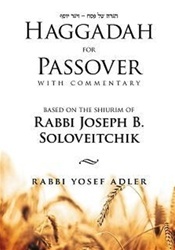 This Passover Haggadah compiles the Ravâ€™s commentary from those shiurim into an accessible resource for pre-Pesach studies and an insightful accompaniment to the Pesach Seder. 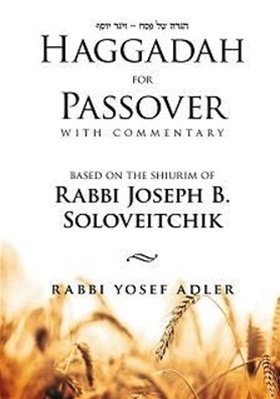 Not only does the Rav illuminate the halachic basis of many of the mitzvot of the Seder, but he also expounds on the traditional text with universal and relevant interpretations. Includes the full Passover Haggadah text in Hebrew with an English translation plus commentary. Rabbi Yosef Adler was a student of the Rav and his personal shamash for two years. He received his rabbinical ordination from the Rabbi Isaac Elchanan Theological Seminary of Yeshiva University, and is both the mara de-atra of Congregation Rinat Yisrael in Teaneck, New Jersey and the Rosh ha-Yeshiva of Torah Academy of Bergen County.